OK so I know you've definitely seen Candeo Colors Jellybean before, but I've never posted swatches before, so work with me here! Jellybean is the most perfect Easter polish ever, from the name to the pastel yellow crelly base filled with candy colored glitter. 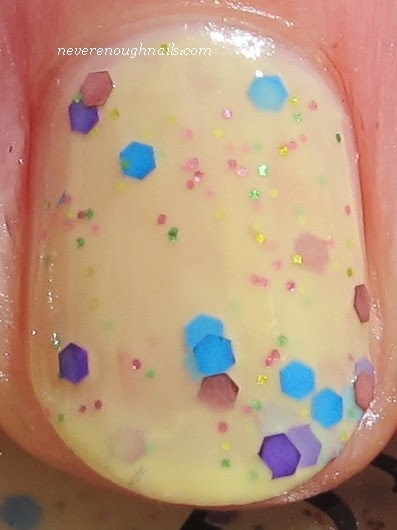 Baby chick yellow says spring to me like no other color and this squishy base is the perfect canvas for turquoise blue, pink and purple hex glitter, with a smattering of tiny green, yellow and pink glitters. Basically all the colors of spring in one polish! This is three coats of Jellybean on it's own and I found it to be nicely buildable. The first coat was a bit sheer, but three coats offers great coverage, while retaining some of that nice squishiness. The formula was great too, I had no trouble getting the glitters on my nails and the yellow was nice and even, no streaks at all. My bottle had been sitting in my Helmer for quite some time, so I did turn it upside down for about 5 minutes before using it, even though the glitters did not appear sunken. Luckily, the maker of Candeo Colors seems to agree that this is the most perfect spring polish, because she stocks it pretty regularly. I love when indie makers keep their best items in stock/restock them frequently. I hate the stress of trying to get LE items. You can buy Candeo Colors Jellybean here and check Facebook for more Candeo Colors info. I love this polish, it's ADORABLE. I recently pulled this one out for the same reasons you did and also found the glitter suspension to be holding really well. I've never tried to do a manicure with Jellybean on its own, have always used undies but it looks so perfect in your photos that I think I'll try it alone next time. Definitely try it on it's own Liz! I love the way glitters look in squishy bases. I did two thin coats and one slightly thicker, so it wasn't hard to get to this opacity!